KZN (KwaZulu-Natal) had lots of traditionally built round houses. I took a picture of this one while we were stopped on the road to let a herd of cows go past. 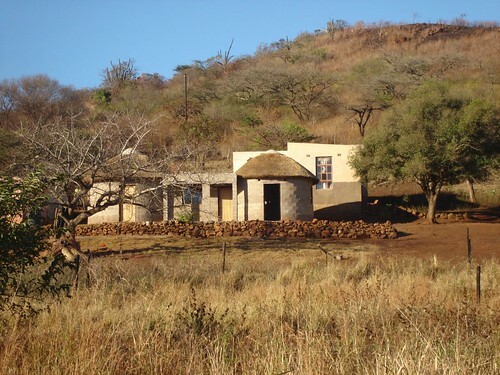 This one is a little more modernly built than most, which are traditional sticks, rocks and mud with a thatched roof. They are very picturesque and I enjoyed looking at them until I realised that most of them had no inside plumbing, the toilet was outside in a building a few hundred metres from the building and the taps were also outside. This country is so beautiful, but there are times driving through it that my heart just breaks. I wondered, as we drove past people walking on the side of the road and drove past their houses, what they must think of us in our fancy hire car. Our world is so different from theirs. It also made me wonder how in the 21st century do we still allow this level of poverty to occur. 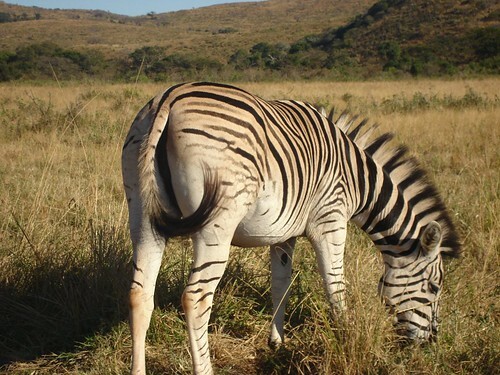 We did a game drive inside Hluhluwe-Imfolosi game reserve and spotted some zebras. 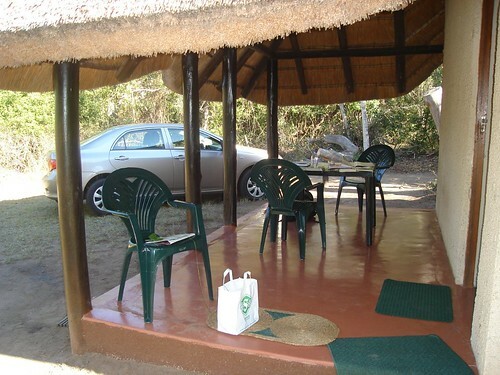 At several points in the reserve there are fenced rest areas where you can get out of your car and have a meal in a restaurant and a walk around. Isn’t the view amazing? There were a number of craft cooperatives in the park and I may have bought some baskets woven from reeds and some bowls woven from electrical wire. One of the reed baskets is currently being used to hold the scraps of fabric from cutting for my next quilt and another is holding roving for spinning. 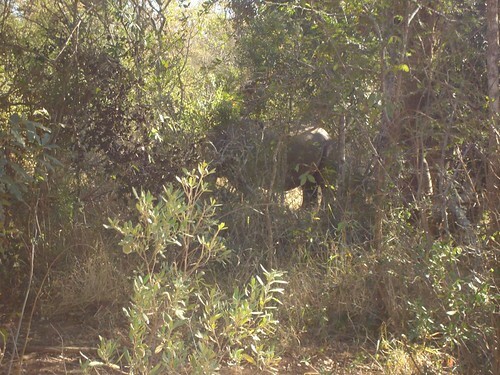 A highlight of the day was spotting a rhinoceros. It wasn’t the best view, but it was my first time seeing one in the wild. If you look really carefully at the following picture you can see its rear end. 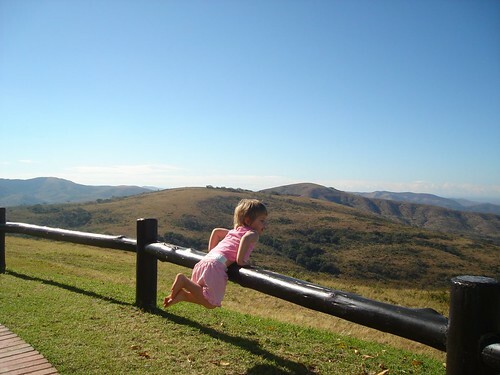 Gorgeous Girl was most disappointed that we didn’t see buffalo or elephants and she spent a good half hour calling for them to come and see her 🙂 Got to love the self-confidence of a two year-old who believes she can summon the wild beasts with her voice. My shoulder is much better, thanks to a visit to my physiotherapist who is a magician. She banned me from spinning and knitting for the weekend (gasp). I got lots of reading done! I have a second session today and that combined with the stretches she’s given me and changing my position on the computer will hopefully solve the problem. I have a quilt finished at the long-armers, but haven’t had a chance to get out and pick it up. 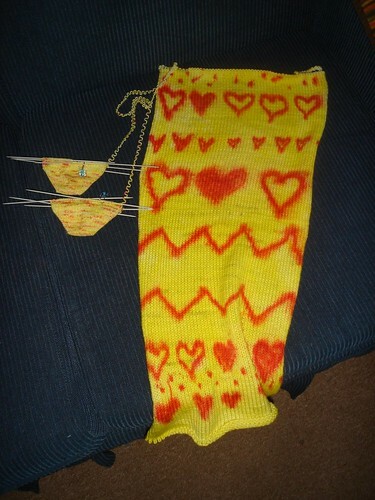 But before we did, there was more knitting. Gorgeous Girl asked for a hat and picked this yarn out of the stash. 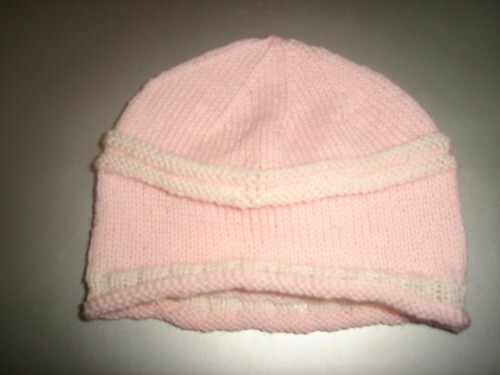 The bottom of this hat was singles that I hated and so plied together. 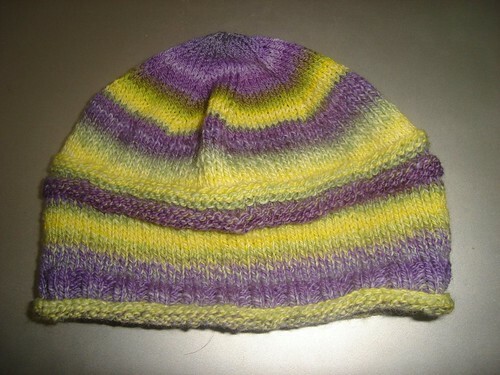 I didn’t have enough to finish the hat so the top is some n-plied sock yarn. You can’t tell the difference unless you look for it 🙂 Fibre dyed and spun by me. 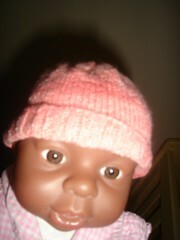 Dolly got a new hat too. Here they are modelling their new hats (actually they were sitting still watching Dora the Explorer, but I’ll take what photo opportunities I can get). 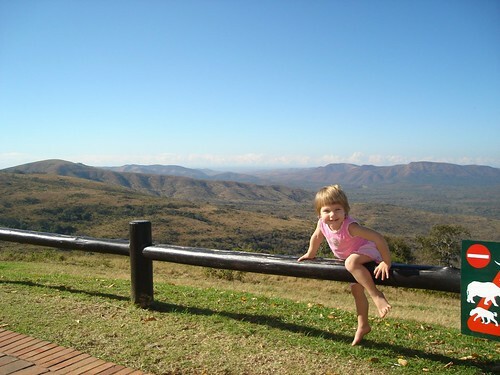 We then picked up the hire and drove up to Hluhluwe. Gorgeous Girl was most excited to have a big girl bed (we are still using her cot/crib). We brought the animals from home. 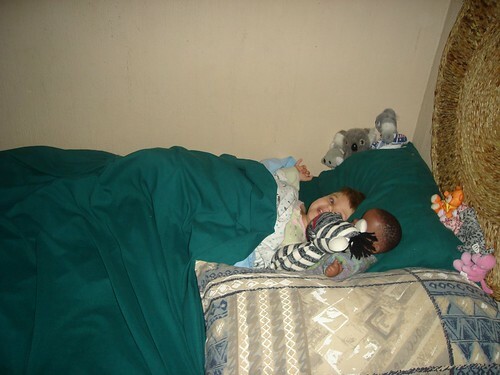 This is a small selection of the zoo that occupies her cot each night. The bedhead was a woven reed mat. These were very cool and were also on the floors. while Gorgeous Man went for a walk to look for birds and butterflies and I did this. A bit of sun and some knitting. Note the fancy schmancy hire car which is much nicer than the 12 year-old piece of junk that we drive at home. I didn’t get as much knitting done as I wanted to while we were on holiday as my shoulder and arms were giving me a lot of trouble. I took three projects and worked on one. I have an appointment with the physiotherapist/accupuncturist tomorrow so hopefully I’ll be feeling a lot better soon. The World Cup is over and life is slowly returning to normal. No more vuvuzelas echoing across the valley as a team scores. Though there is occasionally the sound of one in our living room as I bought one for Gorgeous Girl. Much to my surprise she is able to make a sound out of it (you blow it like a trumpet). The flags are slowly being removed from cars (we’ve removed our Australian flag) and the intersections seem strangely quiet as there are no hawkers selling flags, scarves or mirror covers in various national colours. We had a lovely warm time away. We are now back in the cold. It was 5 degrees C (41F) when I started work this morning and there is a lot of snow (by local standards – I know Canadians would laugh at it) on the mountains nearby. 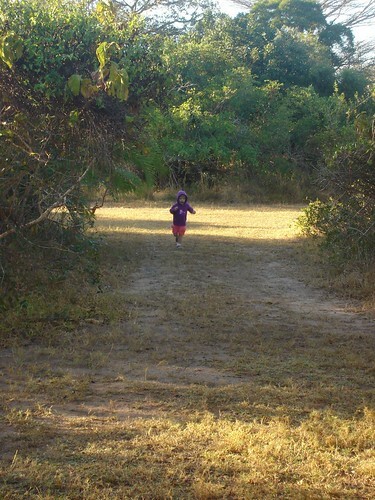 I got to see rhinos on this trip which is a first, but Gorgeous Girl was very disappointed that we didn’t see elephants or buffalo (the two on her wishlist). I’ll do a safari post once the pictures have been uploaded to the computer. In the meantime I thought I’d show you a little bit of what I’ve been working on, since this is a craft blog after all. but it’s turned out OK. There’s not much of it, so it might become a trim for a sweater or a cowl or something like that. I’m a little further along now. 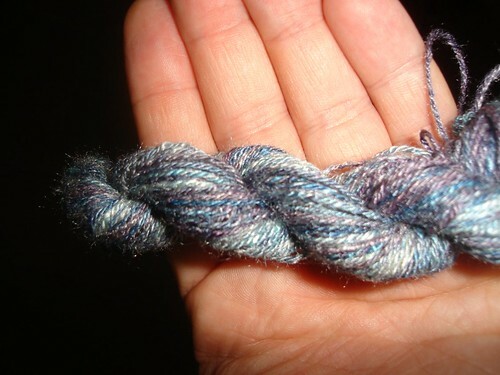 This was a sampler from the fibre club last year – pure silk. I n-plied it (like a three ply) and it’s 22 wraps per inch. This next spin took three months. 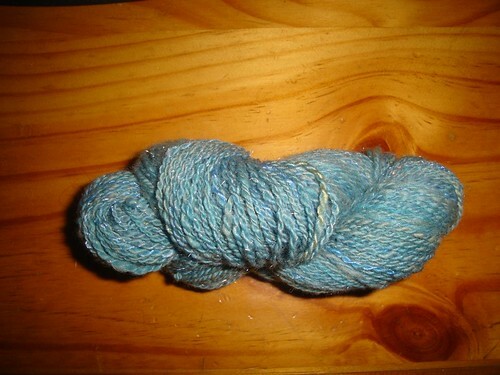 It is 80% merino and 20% silk. I got 1027 (approx) metres (1123.1 yards) and it weighs 180 grams (6.3 ounces). It is 28 wraps per inch. I’m planning a lace shaw for this. The coins are from left: 1 Euro, a US penny, and Australian 5 cent and a South African Rand. The mother of one of my friends is quite ill. 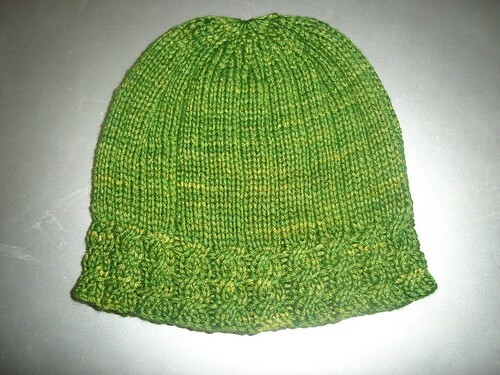 I made her a chemo hat in purple bamboo (which I neglected to photograph) and this one in green. My friend’s mum is a knitter and the yarn came from her stash. 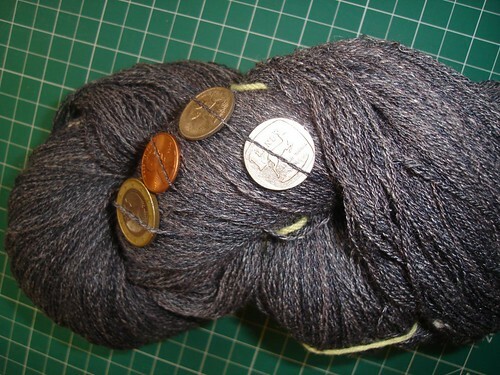 I think it is a locally produced yarn made by one of the ladies I have met via Ravelry, but I’m not sure. We still haven’t found a carer for Gorgeous Girl, so life is a bit more hectic than normal, which is limiting my ability to cruise around the bloggosphere. I’m hoping to catch up with more of you over the next few days.